With three Super Bowl titles and five appearances in that game since 2001 and a league-leading record of 151-57 since 2000, it pretty obvious that the New England Patriots have been the NFL’s best franchise this century. So what has been the reason for their success? Bill Belichick taking over as head coach in 2000? Tom Brady becoming the team’s starting quarterback in the 2001 season? There are probably a handful of other reasons in addition to the above two men who have led the team in the past decade-plus. But let me offer another reason for the Patriots’ success: The Patriots have been great finishers. If you look at the last five games of each season since 2003 (10 seasons times the last five games of each season equals 50 games), the Patriots have compiled a 43-7 record in those 50 games, by far the best record in the league. This .860 winning percentage in the final five games of the season from 2003-12 shows that the Patriots have been a team that finishes the season on a high note. Following are the number of wins for each NFL team in the last five games of the season over the past 10 years (50 games). * Seventeen different teams went 5-0 in the last five games of the season since 2002. As you might expect, the Patriots accomplished this four times (2003, 2007, 2010 and 2011). The other teams: San Diego (2006, 2007, 2009), Miami (2005, 2008), Indianapolis (2008), Denver (2012), New Orleans (2011), Philadelphia (2006), Pittsburgh (2004), Seattle (2012), Washington (2005, 2012). Of these 17 teams that went 5-0, 16 of them made the playoffs that year. The only exception was in 2005 when the Miami Dolphins went 5-0 to end the season but did not make the playoffs. * Of the 20 teams that have played in the Super Bowl in the last 10 years, three went 5-0 in their last five games, six went 4-1, seven went 3-2, three went 2-3 and one went 1-4. The team that went 1-4? Just last season when the Baltimore Ravens ended their season losing four of their last five contests. * The three Super Bowl teams that went 5-0 were the New England Patriots of 2003, 2007 and 2011. Â 1. Will the offensive line continue to protect Tom Brady? The offensive line is a major concern for me going into the season. Dan Connolly filling in for Logan Mankins has played very well. So far overall the line has done their job protecting the quarterback. 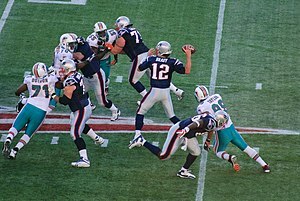 Brady has had time to throw, and has faced little pressure in two games.